First of all, overgrazing is a good problem to have because it means you have a medium to high deer density. 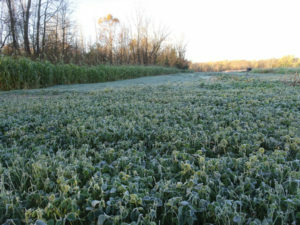 Some of the hunters in northern Wisconsin have such low deer densities that their food plots almost go untouched. Which problem would you like to have? I have had some success with deer repellents you can spray on the crop once it greens up. Depending on the frequency of rainfalls, one application will last about three weeks – less than that if the rains keep washing it off. The new growth after spraying obviously won’t be protected. The leaves that are protected are bringing in energy from the sun to help build a root system for the plant. The main reason for trying to protect your crop early on is to help build a good root system. Once a good root system is developed, a plant can rebound from getting clipped off regularly. Another method to use is conventional fencing. This involves at least seven-foot posts with woven fencing at least six feet high. This method can get expensive and very labor intensive, but …. very effective. You can remove all or part of it at a time to let the deer in when you think the plant can handle being grazed. One of the easiest, inexpensive, and highly successful methods is installing a solar electric fence. I talked to a few landowners who spoke highly about the results of this method. This past year I brought it up to two of my hunting buddies, Randy Williams and Paul Drzewiecki, who own land near Tigerton in Shawano County. I have been helping them with their food plots for years. The overgrazing problem they have is severe. Our mutual friend, Jim Binder, is a landowner, trapper and beekeeper. He has experience with solar electric fencing around his beehives. In bear country, almost all hives are protected with an electric fence. Winnie the Pooh started this whole “bears like honey” problem! Jim gave us a hand by giving us a list of items to pick up. Fleet Farm is a good source, or you can go online for supplies. To get started, $300 will cover your solar fencer (control box), posts, wire or electrical ribbon and insulators. This will cover about a quarter of an acre to experiment with. You can build reasonably from there. Another $100 will allow you to cover around a half acre because you are just buying extra posts and wire. Most solar electric fencers will run three miles or more of wire. Depending on if you run two or three strands to make your fence, you can multiply that distance by two or three to get to your maximum length. Some food plots are protected by two wires. One wire is approximately one foot above the ground and another wire is positioned one foot behind the first and put at a height of 4½ feet. There are many configurations that work. We set ours up with three wires. The first wire was about a foot above the ground. The second one was directly above the first at about two feet. The third was directly above the second wire at approximately four feet above the ground. With the high deer density we had and the severe overgrazing outside of the fence, no deer had successfully penetrated our barrier all summer! Most of what we fenced in was alfalfa. We needed this perennial plant to get big and healthy enough to establish a good root system. We wanted this alfalfa plant to be able to replenish itself with its growth being nipped off constantly. The big dairy farmers in Wisconsin are harvesting their alfalfa with three to five cuttings each summer. However, the first year in these fields, the crop is protected by either not cutting or only cutting once in the late summer to allow it to establish a good root system. This strategy is what we are doing with our food plots by protecting the plant so it can develop and feed deer for years to come. If you’re fencing in annual plants like soybeans, turnips, corn, etc., this fencing works with the same principle. The annual plants can establish a good root system to better withstand the feeding frenzy of the deer. Normally you will want to take the fence down in the fall and put it away for the winter. Randy Williams – the landowner I mentioned earlier in the Tigerton area – wants to move his fence into the woods in the fall where there are a lot of seedlings. He is hoping to protect the seedlings from the winter grazing of the deer. Solar electric fencing is portable and reliable. When not in use, you may want to bring the unit inside, especially in the winter months. In Randy’s case, using it during the winter will keep the battery active. The wire or ribbon winds up easily for storage and the little plastic posts pull out easily. Give this idea a try if you have an overgrazing problem. Start small with your protected area and grow from there if you like the results. You will be “shocked” how good this works. Have a great fall and enjoy your time in the outdoors.